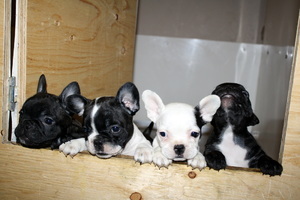 We are giving out four beautiful (2 boys and 2 girls) French Bulldog puppies from a beautiful litter of 6 pups. Our pups are raised in a family environment and are very well socialized. The pups were born on the 17/12/2017 and they are getting to 9 weeks within a few days. Available and experience with shipping when hand delivery is not an option. We try when possible to meet people. We also ship using Petsafe Program to most major airports.